That niece of yours is the most remarkable girl I have seen in years," said Mr. Burch when the door closed. "She seems to be turnin' out smart enough lately, but she's consid'able heedless," answered Miranda, "an' most too lively." "We must remember that it is deficient, not excessive vitality, that makes the greatest trouble in this world," returned Mr. Burch. "She'd make a wonderful missionary," said Mrs. Burch; "with her voice, and her magnetism, and her gift of language." "If I was to say which of the two she was best adapted for, I'd say she'd make a better heathen," remarked Miranda curtly. "My sister don't believe in flattering children," hastily interpolated Jane, glancing toward Mrs. Burch, who seemed somewhat shocked, and was about to open her lips to ask if Rebecca was not a "professor." Mrs. Cobb had been looking for this question all the evening and dreading some allusion to her favorite as gifted in prayer. She had taken an instantaneous and illogical dislike to the Rev. Mr. Burch in the afternoon because he called upon Rebecca to "lead." She had seen the pallor creep into the girl's face, the hunted look in her eyes, and the trembling of the lashes on her cheeks, and realized the ordeal through which she was passing. Her prejudice against the minister had relaxed under his genial talk and presence, but feeling that Mrs. Burch was about to tread on dangerous ground, she hastily asked her if one had to change cars many times going from Riverboro to Syria. She felt that it was not a particularly appropriate question, but it served her turn. Deacon Milliken, meantime, said to Miss Sawyer, "Mirandy, do you know who Rebecky reminds me of?" "I can guess pretty well," she replied. "Then you've noticed it too! I thought at first, seein' she favored her father so on the outside, that she was the same all through; but she ain't, she's like your father, Israel Sawyer." "I don't see how you make that out," said Miranda, thoroughly astonished. "It struck me this afternoon when she got up to give your invitation in meetin'. It was kind o' cur'ous, but she set in the same seat he used to when he was leader o' the Sabbath-school. You know his old way of holdin' his chin up and throwin' his head back a leetle when he got up to say anything? Well, she done the very same thing; there was more'n one spoke of it." The callers left before nine, and at that hour (an impossibly dissipated one for the brick house) the family retired for the night. As Rebecca carried Mrs. Burch's candle upstairs and found herself thus alone with her for a minute, she said shyly, "Will you please tell Mr. Burch that I'm not a member of the church? I didn't know what to do when he asked me to pray this afternoon. I hadn't the courage to say I had never done it out loud and didn't know how. I couldn't think; and I was so frightened I wanted to sink into the floor. It seemed bold and wicked for me to pray before all those old church members and make believe I was better than I really was; but then again, wouldn't God think I was wicked not to be willing to pray when a minister asked me to?" The candle light fell on Rebecca's flushed, sensitive face. Mrs. Burch bent and kissed her good- night. "Don't be troubled," she said. "I'll tell Mr. Burch, and I guess God will understand." Rebecca waked before six the next morning, so full of household cares that sleep was impossible. She went to the window and looked out; it was still dark, and a blustering, boisterous day. "Aunt Jane told me she should get up at half past six and have breakfast at half past seven," she thought; "but I daresay they are both sick with their colds, and aunt Miranda will be fidgety with so many in the house. I believe I'll creep down and start things for a surprise." She put on a wadded wrapper and slippers and stole quietly down the tabooed front stairs, carefully closed the kitchen door behind her so that no noise should waken the rest of the household, busied herself for a half hour with the early morning routine she knew so well, and then went back to her room to dress before calling the children. Contrary to expectation, Miss Jane, who the evening before felt better than Miranda, grew worse in the night, and was wholly unable to leave her bed in the morning. Miranda grumbled without ceasing during the progress of her hasty toilet, blaming everybody in the universe for the afflictions she had borne and was to bear during the day; she even castigated the Missionary Board that had sent the Burches to Syria, and gave it as her unbiased opinion that those who went to foreign lands for the purpose of saving heathen should stay there and save 'em, and not go gallivantin' all over the earth with a passel o' children, visitin' folks that didn't want 'em and never asked 'em. Jane lay anxiously and restlessly in bed with a feverish headache, wondering how her sister could manage without her. 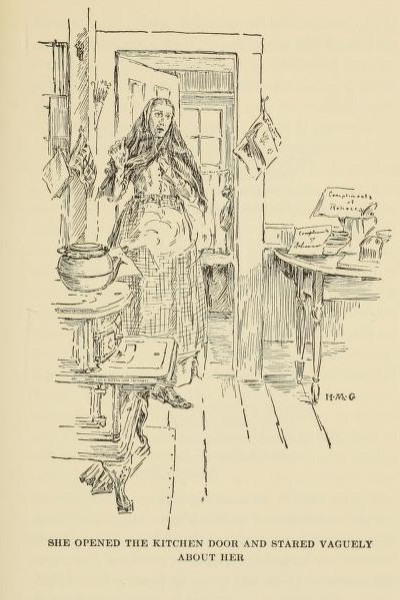 Miranda walked stiffly through the dining-room, tying a shawl over her head to keep the draughts away, intending to start the breakfast fire and then call Rebecca down, set her to work, and tell her, meanwhile, a few plain facts concerning the proper way of representing the family at a missionary meeting. She opened the kitchen door and stared vaguely about her, wondering whether she had strayed into the wrong house by mistake. The shades were up, and there was a roaring fire in the stove; the teakettle was singing and bubbling as it sent out a cloud of steam, and pushed over its capacious nose was a half sheet of note paper with "Compliments of Rebecca" scrawled on it. The coffee pot was scalding, the coffee was measured out in a bowl, and broken eggshells for the settling process were standing near. The cold potatoes and corned beef were in the wooden tray, and "Regards of Rebecca" stuck on the chopping knife. The brown loaf was out, the white loaf was out, the toast rack was out, the doughnuts were out, the milk was skimmed, the butter had been brought from the dairy. Miranda removed the shawl from her head and sank into the kitchen rocker, ejaculating under her breath, "She is the beatin'est child! I declare she's all Sawyer!" The day and the evening passed off with credit and honor to everybody concerned, even to Jane, who had the discretion to recover instead of growing worse and acting as a damper to the general enjoyment. The Burches left with lively regrets, and the little missionaries, bathed in tears, swore eternal friendship with Rebecca, who pressed into their hands at parting a poem composed before breakfast. 'T was in a heathen land. There is a painful lack. And teach them of their Lord. It can readily be seen that this visit of the returned missionaries to Riverboro was not without somewhat far-reaching results. Mr. and Mrs. Burch themselves looked back upon it as one of the rarest pleasures of their half year at home. The neighborhood extracted considerable eager conversation from it; argument, rebuttal, suspicion, certainty, retrospect, and prophecy. Deacon Milliken gave ten dollars towards the conversion of Syria to Congregationalism, and Mrs. Milliken had a spell of sickness over her husband's rash generosity. It would be pleasant to state that Miranda Sawyer was an entirely changed woman afterwards, but that is not the fact. The tree that has been getting a twist for twenty years cannot be straightened in the twinkling of an eye. It is certain, however, that although the difference to the outward eye was very small, it nevertheless existed, and she was less censorious in her treatment of Rebecca, less harsh in her judgments, more hopeful of final salvation for her. This had come about largely from her sudden vision that Rebecca, after all, inherited something from the Sawyer side of the house instead of belonging, mind, body, and soul, to the despised Randall stock. Everything that was interesting in Rebecca, and every evidence of power, capability, or talent afterwards displayed by her, Miranda ascribed to the brick house training, and this gave her a feeling of honest pride, the pride of a master workman who has built success out of the most unpromising material; but never, to the very end, even when the waning of her bodily strength relaxed her iron grip and weakened her power of repression, never once did she show that pride or make a single demonstration of affection. Poor misplaced, belittled Lorenzo de Medici Ran- dall, thought ridiculous and good-for-naught by his associates, because he resembled them in nothing! If Riverboro could have been suddenly emptied into a larger community, with different and more flexible opinions, he was, perhaps, the only personage in the entire population who would have attracted the smallest attention. It was fortunate for his daughter that she had been dowered with a little practical ability from her mother's family, but if Lorenzo had never done anything else in the world, he might have glorified himself that he had prevented Rebecca from being all Sawyer. Failure as he was, complete and entire, he had generously handed down to her all that was best in himself, and prudently retained all that was unworthy. Few fathers are capable of such delicate discrimination. The brick house did not speedily become a sort of wayside inn, a place of innocent revelry and joyous welcome; but the missionary company was an entering wedge, and Miranda allowed one spare bed to be made up "in case anything should happen," while the crystal glasses were kept on the second from the top, instead of the top shelf, in the china closet. Rebecca had had to stand on a chair to reach them; now she could do it by stretching; and this is symbolic of the way in which she unconsciously scaled the walls of Miss Miranda's dogmatism and prejudice. Miranda went so far as to say that she wouldn't mind if the Burches came every once in a while, but she was afraid he'd spread abroad the fact of his visit, and missionaries' families would be underfoot the whole continual time. As a case in point, she gracefully cited the fact that if a tramp got a good meal at anybody's back door, 't was said that he'd leave some kind of a sign so that all other tramps would know where they were likely to receive the same treatment. It is to be feared that there is some truth in this homely illustration, and Miss Miranda's dread as to her future responsibilities had some foundation, though not of the precise sort she had in mind. The soul grows into lovely habits as easily as into ugly ones, and the moment a life begins to blossom into beautiful words and deeds, that moment a new standard of conduct is established, and your eager neighbors look to you for a continuous manifestation of the good cheer, the sympathy, the ready wit, the comradeship, or the inspiration, you once showed yourself capable of. Bear figs for a season or two, and the world outside the orchard is very unwilling you should bear thistles. The effect of the Burches' visit on Rebecca is not easily described. Nevertheless, as she looked back upon it from the vantage ground of after years, she felt that the moment when Mr. Burch asked her to "lead in prayer" marked an epoch in her life. It is only when one has grown old and dull that the soul is heavy and refuses to rise. The young soul is ever winged; a breath stirs it to an upward flight. Rebecca was asked to bear witness to a state of mind or feeling of whose existence she had only the vaguest consciousness. She obeyed, and as she uttered words they became true in the uttering; as she voiced aspirations they settled into realities. As "dove that to its window flies," her spirit soared towards a great light, dimly discovered at first, but brighter as she came closer to it. To become sensible of oneness with the Divine heart before any sense of separation has been felt, this is surely the most beautiful way for the child to find God.